This healthy high-fiber granola is easy to make and so much cheaper and tastier that store-bought granola! But I don’t eat chocolate covered, high sugar breakfasts every day. I strive to keep a bit of balance in my life. Cupcakes and kale chips. Creamy pasta and veggies with hummus. I like to keep thing 80% healthy and 20% insanely delicious. So most days my breakfast (or lunch) features a whole lotta greek yogurt, fruit, and the star of the show: some homemade granola. 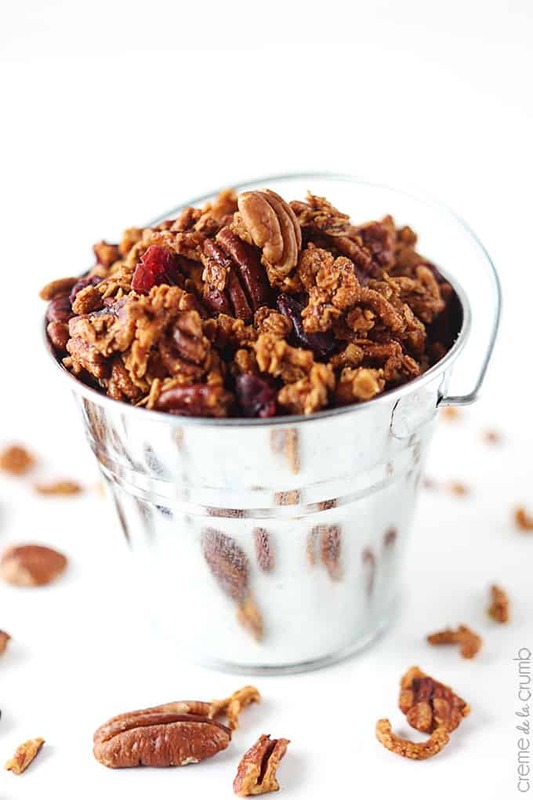 One of my favorites is this High Fiber Cinnamon Pecan Granola. It’s so easy to make, healthy, and cheaper to make than it is to buy the store-bought stuff. My first encounter with Fiber One cereal (which I am not being paid to endorse, I just happen to love it) was when I overheard my brother in law saying he thought it tasted like cardboard. Now I wouldn’t just eat a handful of Fiber One just for the fun of it but I love to use it as a filler. In my cereal, my muffins, and especially my granola. It adds so much fiber to your diet which helps promote healthy digestion and heart health, who can complain about that?? This particular recipe features earthy pecans and oats sweetened with honey and a touch of tartness from dried cranberries, it’s SO good. My husband loves it almost as much as I do. Winner winner! This healthy high-fiber granola is easy to make at home and so much cheaper and tastier that store-bought granola! It's a perfect addition to your breakfast routine or an afternoon snack! Preheat oven to 325. Spray a baking sheet with cooking spray. 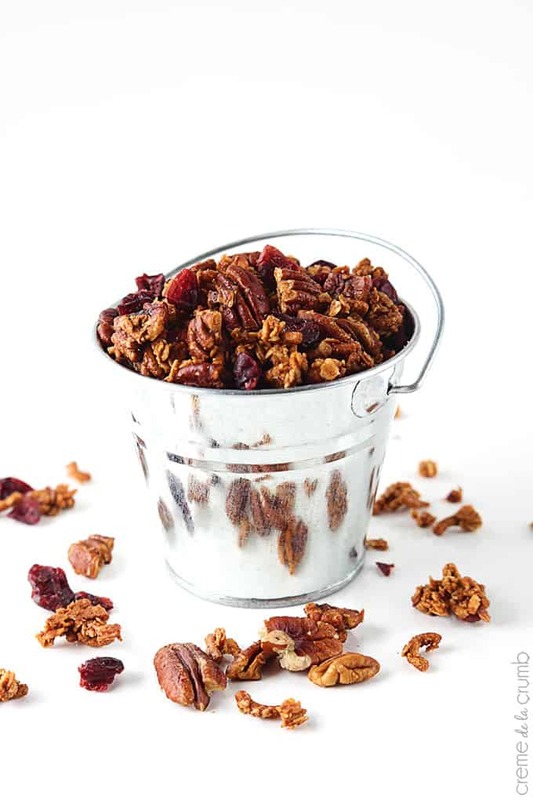 In a large bowl, combine pecans, fiber one cereal, and oats. Whisk to combine. Add remaining ingredients (except for dried cranberries) and stir to combine and coat all ingredients. Spread mixture evenly onto prepared baking sheet. Bake 35-40 minutes. Remove from oven and allow to cool completely. Break up the granola. Mix in the dried cranberries. Store in airtight container up to 3 weeks. Enjoy! I LOVE granola, espeically cinnamon! What a great use of cereal. Cannot wait to try this recipe! Pinned and on my baking list! You know a healthy recipe is good when the husband even agrees that it is! 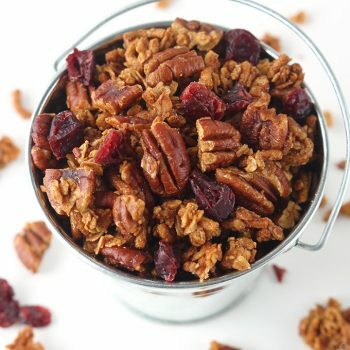 I’m a granola freak and this one looks delicious! I love the extra added fiber thanks to the Fiber One cereal. 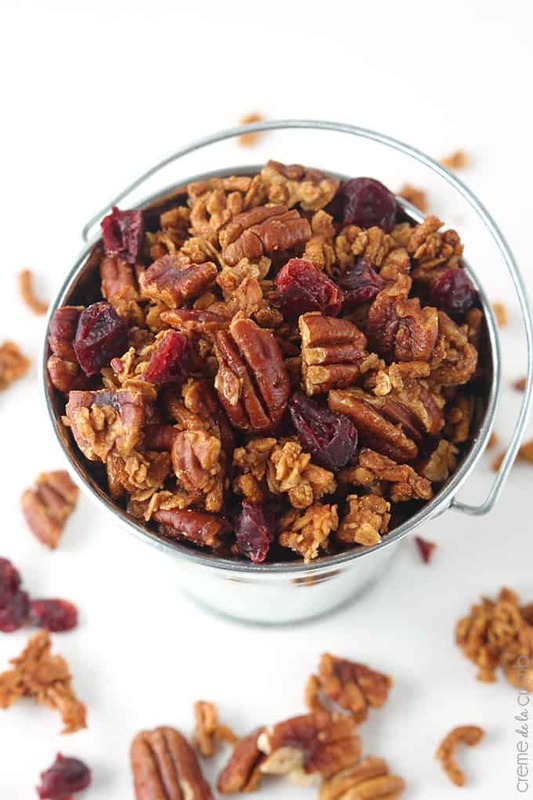 I’ll be adding this recipe to my granola collection! Personally, I like to eat it straight off the baking sheet!! How do you look up recipes on blog. I do not see a place to go. Just curious of how many calories in a serving? Hi Pat, I don’t have those stats on hand but you can use http://www.myfitnesspal.com, it’s free and it’s my favorite tool!